Commercial sealcoating for a parking lot is big part of our business. It's also very important for the owner to keep up on the appearance of their parking lot. If you are considering a commercial sealcoating for your parking lot, Houck Asphalt Maintenance suggests you call us to review some benefits of sealcoating your commercial property no matter how long it has been since your asphalt parking lot was last sealed. Sealcoating, also known as a pavement sealer, is protection for a parking lot that is made to help your asphalt parking lot last much longer. The professionals at Houck Asphalt Maintenance will tell you that since asphalt is porous; we use a sealcoating to insure that it will shed water and any other type of chemicals from absorbing and damaging the asphalt parking lot. 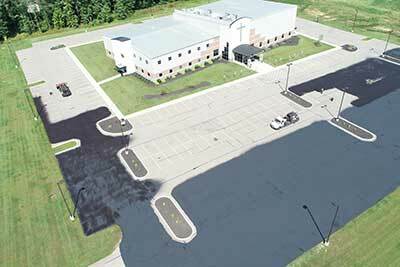 Here at Houck Asphalt Maintenance Company we do professional sealcoating jobs for any size parking lot. It's one of the biggest portions of our business and we do sealcoating better than anyone else. When a commercial parking lot is in need of asphalt maintenance you need to contact us at Houck Asphalt to come in and sealcoat the parking lot. The risk and cost that is associated with not using a professional like our company, just to save money could end up costing you as the customer more in the long run. At Houck Asphalt Maintenance we always come prepared. We have a fleet of equipment and specialists that will get the job finished in a timely manner. We also have the required liability insurance coverage plus workers compensation that protects your property and us as a business. Houck Asphalt Maintenance will bring all the proper professional equipment and materials to sealcoat the parking lot from start to finish. For a commercial parking lot, there are usually only two types of sealcoating for pavements. Here at Houck Asphalt Maintenance, it's our job to make sure the customer knows and understands the benefits of each sealcoating that will include: petroleum based (coal tar) and asphalt-based. These options have their own specific advantages, but most of our customers, after discussing where the commercial parking lot is located, are informed that coal tar based sealants are best and longest lasting. Every sealcoating project is different and there are plenty of important things involved in the sealcoating business. One of the more crucial considerations is the initial application of the sealcoating by our professionals. Prior to the application, the surface must be completely clean and dry. Here at Houck Asphalt Maintenance, we use sweeping methods as well as blowers to properly prep the parking lot for the first sealcoating layer. To the novice person, this sealcoating preparation may seem like overkill, but our pros know that if the surface is not clean and dry, it will end up with a poor adhesion, which is not how we do business at Houck Asphalt Maintenance. 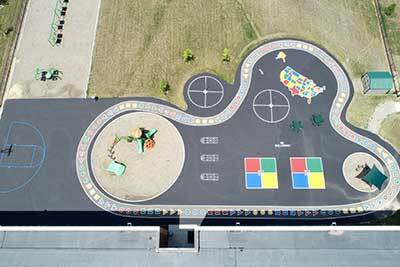 Pavement sealers are applied with several choices. Pressurized spray equipment or the use of self-propelled squeegee machines or simply using a squeegee or broom by hand. 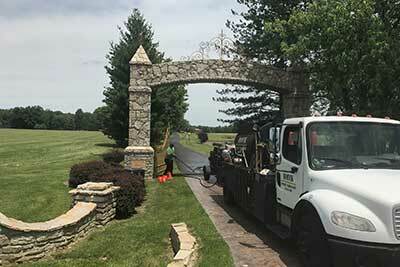 But one thing that separates the novice from the professionals like us at Houck Asphalt Maintenance is that the equipment used must have a continuous agitation in order to maintain the required consistency of the sealcoating mix. The entire process will be a either a single or double coat sealcoating process requiring 24 to 48 hour of curing before vehicles can be allowed on the commercial parking lot. Once the surface is properly prepared, then mixed sealcoating will be applied. Finally, take a look at your last sealcoating job. Was that sealcoating smooth or rocky? If your parking lot is in need of some maintenance then its time to call Houck!